A Cabinet memorandum in this regard submitted by Resettlement, Rehabilitation, Northern Development and Hindu Religious Affairs Minister D. M. Swaminathan was approved. Hindu Cultural Affairs Director Uma Maheswaran told the Daily News that the slaughter of animals such as goats and fowls in Hindu temples would be banned by this legislation. He said the Cabinet-approved draft legislation would be sent to the Legal Draftsman’s Department for final consent. It will then be sent to the Attorney General’s Department and published in the gazette. He said the law would come into effect once passed by Parliament. According to the Cabinet Memorandum, animal and bird sacrifices in Hindu Temples or its precincts will be prohibited. “One of the primitive methods of worship is animal and bird sacrifices, while the majority of Hindus do not accept the practice. 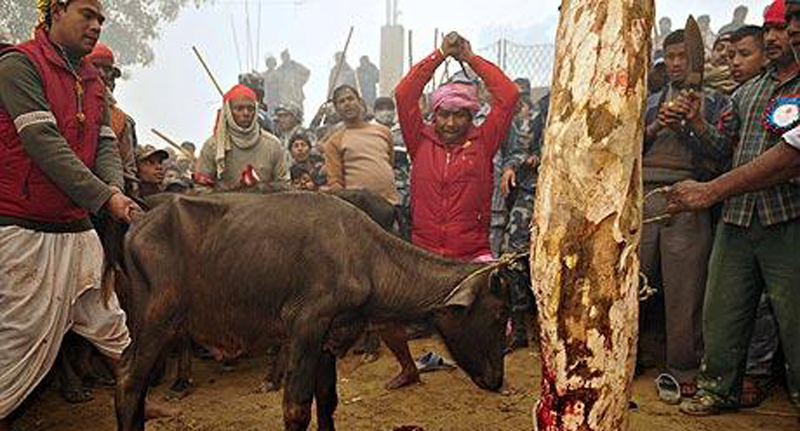 Slaughtering of animals is carried out in public in open courtyard of the temple without considering health and mental harm of the devotees. Legislation to ban animal sacrifice in Hindu temples is operative in India. The members of Parliament representing the Hindu Community and Hindu Association in Sri Lanka are of unanimous view that sacrifices of any living being in the name of Hindu Religion should be banned and made a punishable offence,” the Cabinet memorandum elaborated. Jaffna High Court Judge M. Ilancheliyan, delivering a ruling in a case filed by the All Ceylon Hindu Maha Sabha against the killings of animals at the Kavunawatte Narasimmar Kovil festival in October last year, prohibited the slaughter of animals in Hindu kovils. “Fundamental characteristics of most of the religions are “Ahimsa” and non-cruelty towards all living being. Hindu Religion practiced by a substantial section of the Sri Lankan population is vigorously preaching this concept and declares it as sinful and advocates the prevention of killing of any living being,” the Cabinet memorandum noted. “There is no institutionalised structure for the regulation of activities carried out in the name of Hindu Religion. Almost all Hindu temples and religious institutions in the country are managed by individuals or management committees elected by people. There is no regulatory mechanism to impose or guide line or instruction unified practice in these temples and left in the hands of these individuals or Management Committees,” it added.